USS Sulaco — тридцатый корабль в серии десантных кораблей типа «Конестога». С момента её последнего ремонта в её конструкцию включили новую разработку — «блок 74», и считалось, что она должна послужить еще пять лет, прежде чем быть списанной и присоединиться к своим сестрам в коммерческой службе. Корабль морпехов, посланный на LV-426 в 2179 году. На Сулако было оставлено яйцо с королевским лицехватом, кровь которого начала прожигать пол, в результате чего сработала система безопасности, распознавшая это дело как пожар. Спасательная капсула с Сулако попала на Фиорину. Позже корабль обнаружили WY, пригнали обратно к LV-426 и пристыковали к Легато. Сбежавшие оттуда колонисты Стоун и Терк нашли Хикса. Однако, позже, когда прибыли пормехи с Сефоры, Сулако потерпел крушение на злополучном планетоиде. The Sulaco is named after a fictional town in Joseph Conrad’s 1904 novel Nostromo (the name of which was used for the USCSS Nostromo in the original Alien). A number of other ships in the franchise are named after elements from Conrad’s works as well, including the USCSS Patna (from Alien3), the USS Verloc (from Aliens versus Predator 2), the USS Marlow (from Aliens vs. Predator) and the USS Sephora (from Aliens: Colonial Marines). Some social sciences research into the Alien franchise’s symbology has considered it significant that Sulaco in Conrad’s Nostromo is the home of the white owners of the silver mine figuring in the book, while the Sulaco in Aliens transports soldiers to investigate unknown troubles at a corporate outpost of Weyland-Yutani and to protect the investment — drawing parallels between the corporate owners in Conrad’s work and the shadowy business entity forming a central part of the Aliens franchise. Syd Mead, a principal conceptual designer on Aliens, first designed the Sulaco as a massive sphere, a “heavily armed cargo ship, outfitted to transport material”. However, it was realised the spherical shape would create problems with focusing the camera, and was also difficult to impart with a sense of scale. The design also did not meet with James Cameron’s vision of a more streamlined craft; he produced a quick sketch of the style of ship he imagined and noted that he was imagining something like a “a forest of antennae enter[ing] the frame, followed by the enormous bulk of the SULACO“. While some claim that the basic shape was based on a submarine, the design has most often been described as a ‘gun in space’ due to the elongated form resembling the Pulse Rifles used in the movie – with Syd Mead agreeing that (in addition to Cameron’s preferences) this was one of the reasons for the switch from the spherical form. Other film analysts have remarked on how the opening shot of the ship as something sinister and weapon-like presages Ripley’s transformation during the movie into a warrior figure, akin to the hardened Marines the Sulaco already carries. The opening shot of the ship travelling through space has also been called ‘fetishistic’ and ‘shark-like’, “an image of brutal strength and ingenious efficiency” – while the rigid, mechanic, militarized interior of the Sulaco (designed by Ron Cobb) is contrasted to the somewhat more organic and friendly interior of the Nostromo in the first movie (also designed by Cobb). Other sources have noted the homage the initial scenes on board the Sulaco pay to the opening tour through the Nostromo in Alien, particularly in the extended Special Editioncut of Aliens. Mead has denied rumors in the fan community that actual scientific research had been done into how a futuristic spaceship might work. As an example, he noted that the idea for the early spherical design had nothing to do with creating centrifugal gravity, as such problems had evidently already been solved by science by the time of Alien. The model of the Sulaco was constructed by Peter Astin and detailed by Pat McClung, John Lee and Robert Skotak (on one side only; the other side would not be seen by the camera). The Sulaco’s approach to LV-426 was storyboarded by Roger Dear. Due to budget restraints, only six hypersleep chambers were constructed for the film, each at a price of over forty-three hundred dollars. The illusion of additional chambers was achieved by using mirrors. The Locker Room lockers were built to open with key cards and were fully functional in this capacity. Three different scale models of the Drop-ship Bay were constructed for production: a full-scale partial set for the actors’ scenes built on one of Pinewood Studios’ largest sound stages and two miniature sets, one of which was constructed eight feet wide and twenty feet long with two six-foot Dropships inside. Originally, the Sulaco was going to be seen partially exploding at the start of Alien3 after the EEV jettisoned, signalling its destruction. While the models for this scene were built, it was apparently scrapped before filming, although the sequence appeared in the novelization of the film. In the video game Aliens: Colonial Marines, players have the ability to explore the armory and hypersleep chamber aboard the Sulaco. However, there are numerous errors with the name tags on the lockers found there, several of which are attributed to Marines that did not exist in the film (these names likely reference members of the development team on the game, a common practice, as well as a humorous locker belonging to Private “S. Villarreal”). 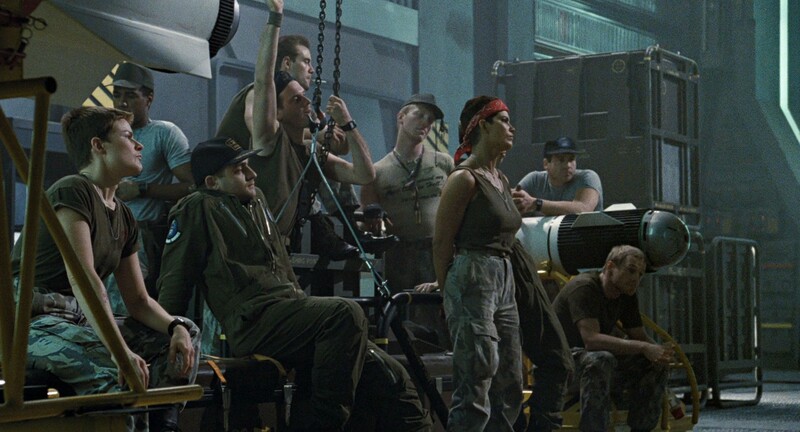 Furthermore, some of the Marines from Aliens have a locker in the hypersleep chamber but not the armory. Private Tim Crowe’s locker also has a nameplate that incorrectly reads “S. Crow”. 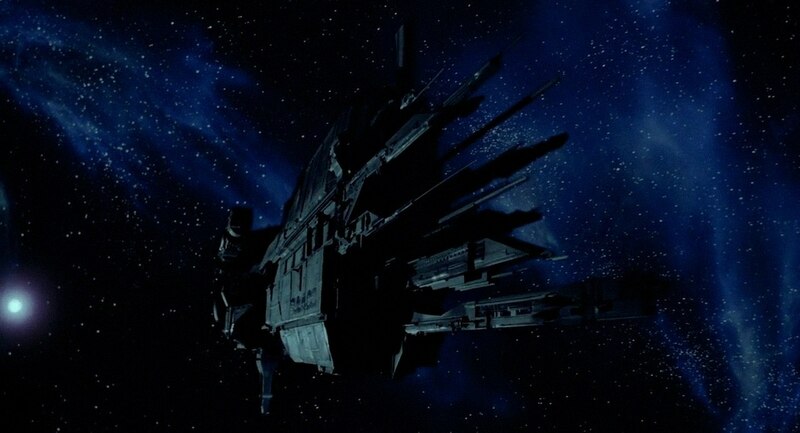 The Sulaco is the third ship shown to have an on-board basketball court in the Alien franchise, the first being the USM Auriga and the second being the USCSS Prometheus.